The term “slipped” disc is a misnomer. Disc do not actually slip they either bulge, tear (herniate) or rupture. 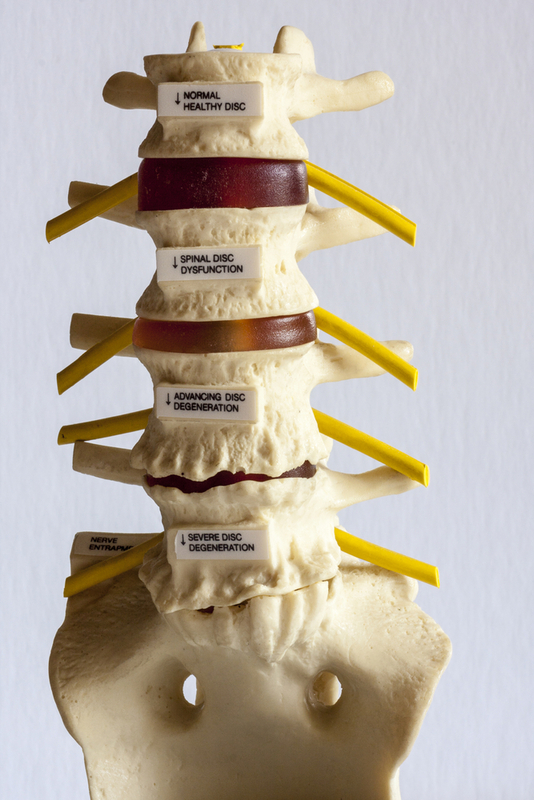 We have 23 discs throughout our spines; however, by far the most commonly injured ones are the last two lumbar (lower back) discs. The disc is like a jelly filled doughnut. It’s jelly on the inside and fiber on the outside. The disc may be injured in several ways: the disc can bulge, bulge and partially tear, or tear completely through. The disc is very pain sensitive because it has nerves running through the outer portions of it. Additionally there are spinal nerves which run behind and to each side. If the disc injury becomes large enough, then these nerves can be affected. Symptoms of numbness, tingling, or weakness can develop. However, I have treated numerous disc injuries throughout my twenty year of practice. Most of them do quite well with chiropractic treatment. Each case is different and always begins with a very careful, thorough evaluation of my patient. Once I have examined the patient, we discuss the course of treatment best suited to address the particular disc problem at hand. My initial treatment concentrates on decreasing inflammation, pain, and swelling in the disc. Later stages of care will address mobilization, strengthening, and stabilization. Truly, only 1 in 100 disc injuries require surgery. The reasons for surgery are generally three. The patient is in too much pain and cannot get comfortable, they have neurological problems (difficulty passing urine or stool) or everything else has failed. Gentle chiropractic treatment is very effective in treating most disc injuries. By restoring normal motion to the joint, the disc is able to heal and scar tissue formation is reduced. In most disc cases the first two to three weeks of treatment are very important and tell me a lot about the patient’s expected recovery. Once the patient’s symptoms decrease we can increase their activity levels and add a program of stretching and strengthening to the treatment plan. My patient’s are constantly monitored for improvement. If a patient does not improve as expected, they are re-evaluated and a different strategy or approach is used to get them well. Once a disc patient is feeling better, their treatment becomes even more critical. Pain is just a warning sign. The absence of pain does not mean that the disc injury has been resolved. At this point in their treatment, I concentrate on developing a routine for further improvement and to prevent re-injury. I like to evaluate the whole person from diet to exercise to social habits. My objective for each of my patients is to educate them to ultimately enable them to care for themselves more effectively and on their own once they have been released from my care.